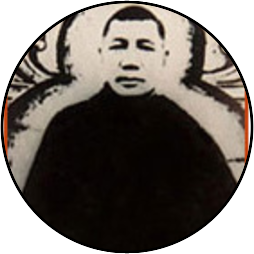 Also known as Khenpo Shenga, Shenpen Chokyi Nangwa, was the incarnation of Shenphen Thaiye and an important figure in the Rime movement. He revitalized monastic scholasticism of the Nyingma tradition in Eastern Tibet, founding shedras which focused on the study of the classical Indian treatises. He was born in a place called Drok Ruma and lived an ordinary life there. One day, he was struck by the profound futility of samasara and how he had been wasting his precious human life. Without delay, he packed his few possessions and went in search of the great Patrul Rinpoche. Patrul Rinpoche introduced him to the master who would become his root lama, Onpo Tenzin Norbu. Despite his advanced age and his inability to read, Shenga was accepted as a student. He faced great ridicule from the other monks who called him "the grown up kid". Nonetheless, Shenga persevered in his studies and soon became a great scholar and was said to be unbeatable in debate. Around 1902, Thubten Chokyi Dorje, invited him to teach at the monastic college at Dzogchen Monastery. At the time, he was unknown, but as word about the clarity of his teachings spread, monks flocked to his classes. His reputation as a great teacher spread throughout Kham. He wrote many original commentaries on the Indian scriptures including the Bodhicharyavatara (Way of The Bodhisattva). He taught continuously for twenty years and had many illustrious disciples including Dilgo Khyentse Rinpoche.